Clouds are an important element of almost all landscape paintings. Unless you are strictly a still life or portrait painter, you will come across many clouds of varying shapes and colors to paint in your scenes. 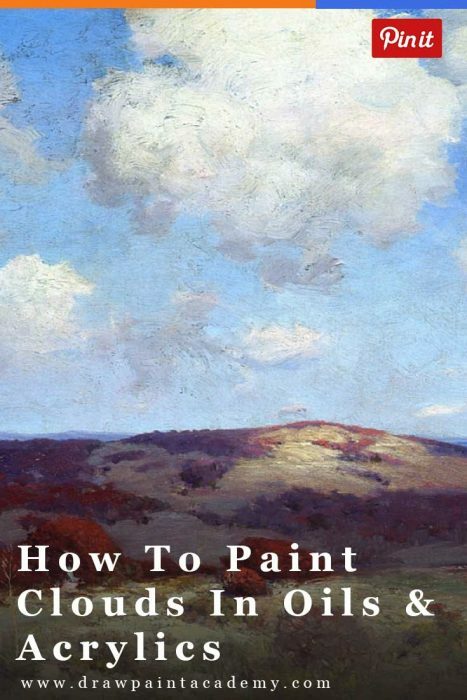 In this post we will discuss how to paint clouds. This is the typical image most people have in their minds of what a cloud is supposed to look like. But in reality, clouds have no fixed size, shape or color. They have an infinite number of forms and if portrayed correctly, can really enhance your painting composition. Beginner painters can really struggle with this idealised vision of clouds, to the extent they paint this vision rather than what they actually see. If this sounds like you, then I urge you to try forget everything you know about what a cloud looks like and rather just paint the shapes, colors and values which you see. 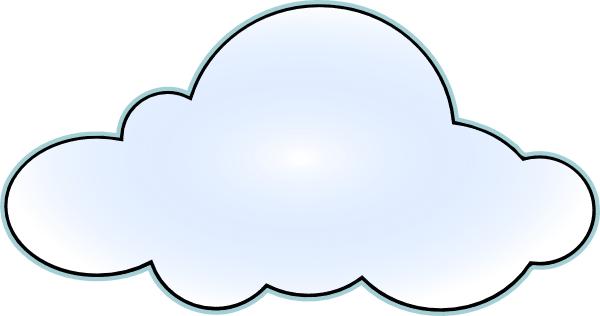 I cannot show you exactly how to paint clouds as there is no set procedure which suits all situations, but I can give you some tips which you can broadly apply when painting clouds. Do not start straight away with the pure titanic white for your clouds. The pure white should be left until the very end for tinting if necessary. Often titanic white can be too strong in a painting and you should instead try toning it down for the final tints. Do not be afraid to experiment with different colors. Rarely will your clouds be just blue and white. If you find yourself just using blue and white for clouds, then you could try expand your horizon by painting a sunset or sunrise. This will force you to use a wide range of colors to render those dramatic scenes. Unless there is some sort of freak arrangement of clouds in the sky, the clouds will not all be the same size and shape. They will be scattered over the horizon. Use your knowledge of perspective to accurately portray the sizes and shapes of the clouds. You need to picture the clouds relative to your line of vision. For the clouds which are right above you, they will appear larger and you will see less of them in number. On the other hand, the distant clouds will be relatively smaller in size and greater in number. In the point above, we talk about the clouds relative to your line of vision (which determines the visual shape of the clouds for your painting). Now to incorporate the third person to the party, the Sun. The position of the sun relative to the clouds determines how light hits the clouds. Sometimes it is best to just give a slight hint of the presence of clouds, rather than making it obvious. You can do this by roughly adding some strokes of bright and dark tones to the general clouded area to break up the sky. You can also use brush strokes against the flow of the rest of the sky (a technique used commonly by Vincent van Gogh, who often used dominant brush strokes to portray elements in his paintings). By just hinting of clouds, you leave much to the imagination of the viewer. Remember, the imagination is your most powerful tool as an artist. Up close, it looks just like a bunch of random strokes and tones, but I assure you they look like clouds once you step back. First I put down the dark areas of the clouds (the shaded parts) using various grays. I do not use much paint for these areas and keep it very soft. I work up in value towards the highlights, where I start using thick paint straight from the tube. 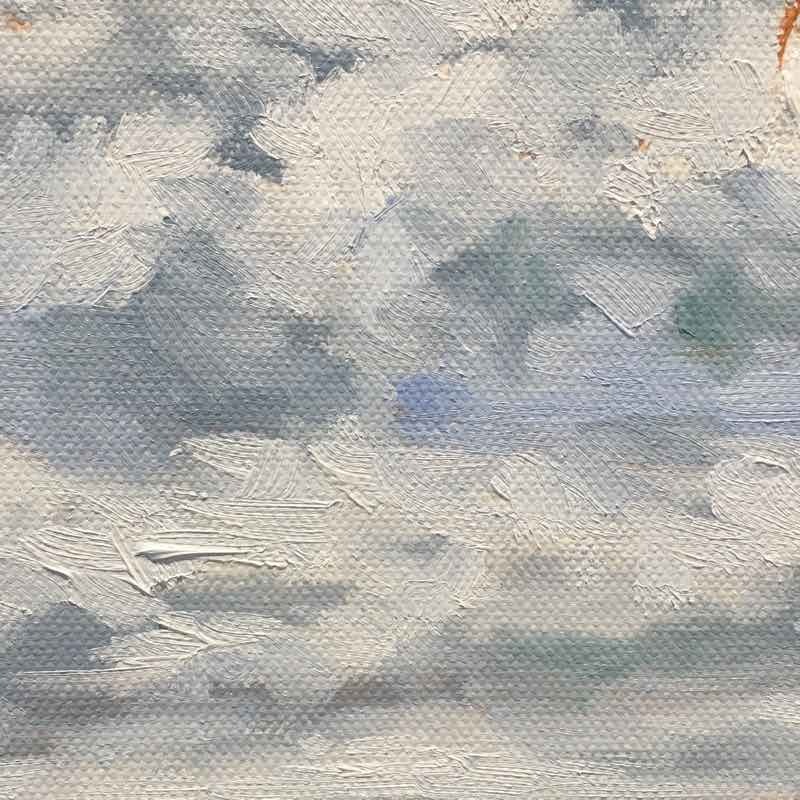 My brush of choice for painting clouds is a filbert as it has those soft edges perfect for blending the clouds in with the rest of the sky. Now let us look at some different examples of clouds painted by the masters. Here Monet uses the clouds in the painting to balance the composition. 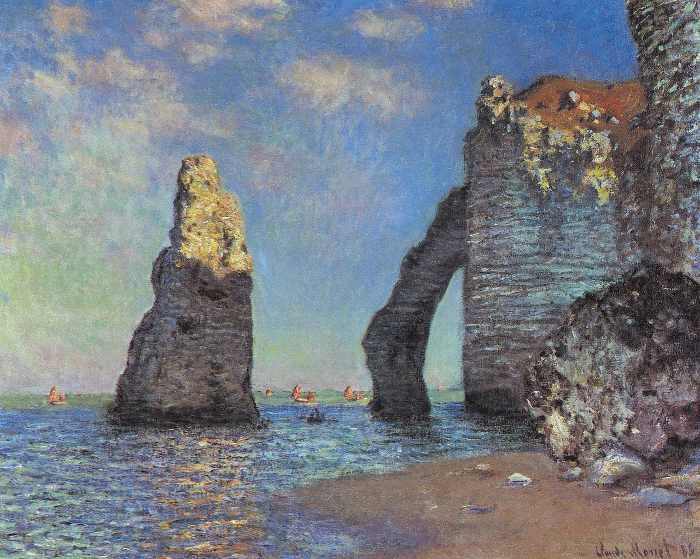 Without the presence of the clouds, the right side of the painting (from a viewer’s perspective) would be dominant with the large rock elements. The clouds are rendered with subtle grays and yellow / greenish tones. 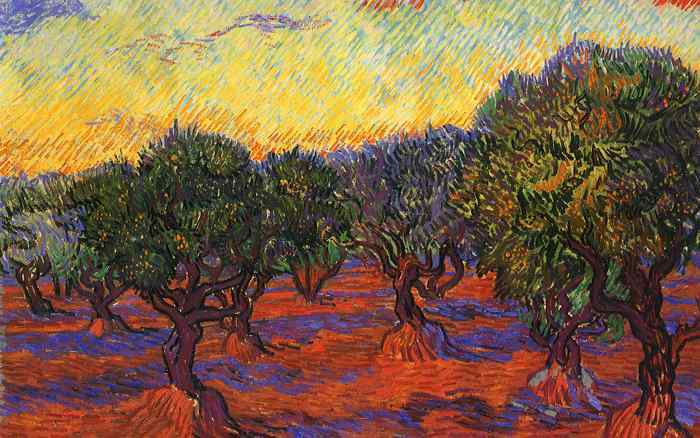 The colors used to render the clouds are similar to the colors used in the rest of the painting, which creates harmony. In the distance, the clouds almost blend in with the rest of the sky and are pushed back in perspective of the painting by use of the faint, purple tone. If you ever want to give the indication of distance, then blue, purple and gray are your friends. One of the most famous paintings of all time. 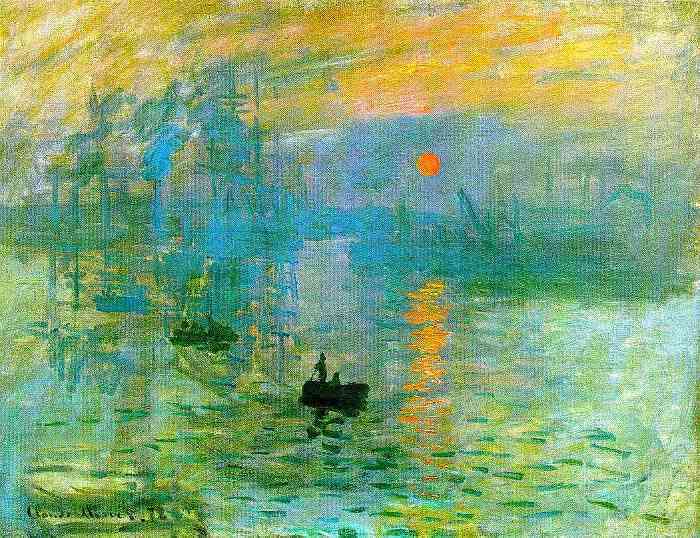 The whole impressionist movement was named after this painting. Here Monet only gives the indication of a broken, cloudy sky with rough strokes of different tones. There is no way to tell where the clouds exactly are in the painting, but you definitely get the impression they are there. Note the mix of cool and warm colors in the sky used to create an interesting contrast. Here van Gogh gives the impression of clouds with strokes of purple and red against the flow of the rest of the sky. The colors and directional lines create a very sharp contrast between the clouds and the rest of the sky. The colors used for the clouds are also used in the lower part of the painting which promotes harmony. Love your teaching ! Simple and direct easy to understand! Thanks ! Going to share with my Senior beginners class! Very new to this. Got canvas and acrylic paints for Christmas. Do you paint the background for the sky first or as you go? paint better. A great big THANK YOU from Toronto, Ontario. CANADA! Thank you for your comment and kind words! I am just happy to help. I have thoroughly absorbed your instructions throughout this site and will benefit much in the coming year as I find more time to draw and well not so paint. You see I’ve started using soft pastels and quite like them at present but cant cant find anyone that actually has a site like yours that can guide and explain as you do. I’ve begun applying your methods critically over my “finished” pieces and my nievety is apparent. This is good news and if they were painted I could fix them but pastels are not so easy…any ideas? names or sites that may help.